Le Plan de Paris de 1873. 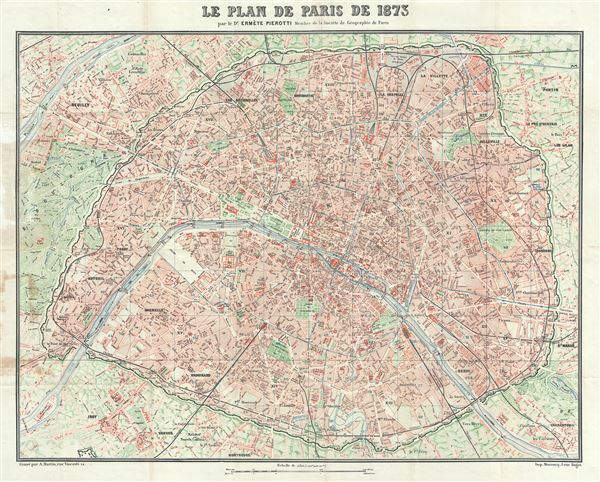 This is an attractive 1873 map or plan of the city of Paris, France by Dr. Ermete Pierotti. Centered on the Seine, the map covers the embastilled Paris as contained by the Thiers Wall, as well as its immediate vicinity, including the Bois de Boulogne and the Bois de Vincennes. It reflects the transformation and modernization of Paris under Napoleon III and George-Eugene Haussmann. Known in French as the 'Grands Travaux,' Haussmann's redesign of Paris defined it as a modern city, with narrow alleyways and confusing streets replaced by a broad network of grand boulevards, imposing facades, parks, and monuments. The map is divided into 20 arrondissments (20 administrative districts), detailing individual buildings, streets, monuments, gardens, and a host of other important landmarks. It predates the Eiffel Tower, and shows exceptionally remarkable attention to detail in the public gardens where subtle expressions of landscape design are apparent. The map is accompanied by a 48 page booklet consisting of a detailed street index and other important tourist information. This map was engraved by A. Martin, printed by Monrocq and prepared by Dr. Ermete Pierotti, member of the Society of Geography of Paris, in 1873. Very good. Minor wear and toning along original fold lines. Some foxing near left margin. Accompanied by original cover and booklet. Professionally flattened and backed with archival tissue.